SUNLIT UPLANDS: Daniel Hannan to Americans: Please Stop Calling Us Europeans! Daniel Hannan to Americans: Please Stop Calling Us Europeans! 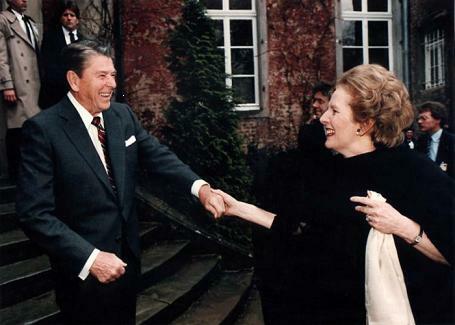 The Gipper never called her a European. The Cousins have finally clocked the EU for what it is: a corporatist, protectionist, anti-American racket. Heaven knows it took them long enough. For decades, they did everything they could to encourage political integration, pouring money into the European Movement, ending every summit with a demand for deeper union. The change in attitude has happened over the past decade. As late as the first Bush presidency, most American opinion-formers, including most conservatives, vaguely favoured the idea of a united Europe. Federalism had worked on their side of the Atlantic, they would tell you, and Americans were fed up with being dragged into European wars. Nowadays, if you hear this sort of rot, you're almost certainly talking to a State Department official. Why the new mood? In part, it's a delayed reaction to Europe's anti-yanquismo. The moment the Cold War was over, Euro-federalists started calling for Brussels to take on the hyper-power; but it wasn't until the second Iraq war that most Americans realised quite how intensely the Brussels élites disliked them. Nor is anti-Americanism confined to the Left. Last month, for example, the influential Christian Democrat who chairs the European Parliament's Foreign Affairs Committee, argued that the euro crisis was the result of a British-American plot. The US originally saw European integration as a way to strengthen the Western alliance; the CIA even kept some prominent Euro-federalists on its payroll. We can argue about whether or not this reasoning was justified even in the 1950s, but it is plainly redundant today. The trouble is that bureaucratic assumptions tend to outlive whatever rationale they began with, which is why the diplomatic corps is now the last redoubt of Anerican Euro-enthusiasm. Britain is a common-law democracy, connected by outlook and sentiment to the wider community of English-speaking nations. We may be only 22 miles from Europe but, these days, distance hardly matters. Look at where our international telephone calls go: North America, the Caribbean, the Indian subcontinent, Australia, New Zealand. In an age of Twitter and cable television, geographical proximity is trumped by ties of language and law, habit and history, blood and speech. As a Europhile columnist recently lamented, the Internet has trapped us in the Anglosphere. Which, if you think about it, is another way of saying that our cultural élites no longer get to tell us who we are.